Our previous report on Bandai (also called Bandai-san) discussed a significant increase in seismicity during 14-16 August 2000 (BGVN 25:08). However, no eruption resulted and no large change in GPS data was noted. The volcano is located in Fukushima Prefecture, Japan, about 220 km N of Tokyo (figure 2). This report notes that volcanic tremor was recorded in June 2012. Figure 2. A map of the major volcanoes of Japan. Bandai is just N of Tokyo. Courtesy of the U.S. Geological Survey. Recent monthly reports of volcanic activity from the Japan Meteorological Agency (JMA), translated into English, resumed in October 2010; the only recent report on Bandai was in June 2012. Thus, in this report, we lack JMA reports between January 2005 and May 2012 and only summarize activity during June 2012. According to JMA, on 25 June 2012 volcanic tremor with a duration of 45 seconds was recorded, the first since 9 June 2009. No change in volcanic earthquakes, ground deformation, or fumarolic activity was observed. Volcanic earthquakes have remained at a low level at least through September 2012. A camera located at Kengamine (~7 km N of the summit) showed that gas emissions remained low, rising less than 100 m in height. Information Contacts: Japan Meteorological Agency (JMA), Otemachi, 1-3-4, Chiyoda-ku Tokyo 100-8122, Japan (URL: http://www.jma.go.jp/). The Global Volcanism Program has no Weekly Reports available for Bandaisan. Table 1. Daily number of felt earthquakes at Wakamatsu Observatory, 10 km W of the epicentral area of the Bandai swarm, June 1987. Information Contacts: Japan Meteorological Agency (JMA). Seismicity increased toward the end of November. A total of 188 events were recorded by the seismometer 1.8 km NNW of the summit, up sharply from the background level of ~20/month (figure 1). Figure 1. Monthly number of recorded earthquakes at Bandai, 1965-88. Courtesy of JMA. Information Contacts: JMA; AP; UPI. The last increase in seismicity at Bandai (located in the Fukushima prefecture about 20 km N of Tokyo) occurred in November 1988 (SEAN 13:11) when a total of 188 seismic events was recorded, up sharply from the background level of ~20 events/month. In contrast, at the same site up to 416 seismic events were recorded in one day when seismicity increased during 14-16 August 2000. On the afternoon of 16 August the Japanese Meteorological Agency (JMA) issued a volcano advisory for Bandai. An abnormally high number of earthquakes, including felt earthquakes and volcanic tremor, was recorded at the A site seismometer 1.8 km SSE of the summit. The increase began on 14 August when 179 seismic events were recorded; this was the greatest seismicity to occur at the volcano since seismic monitoring began in 1965. On 14 August two of the four M 2 earthquakes that occurred were felt, and a volcanic tremor event lasted for 31 seconds. On 15 August the level of seismicity increased to 416 events, and two volcanic-tremor events lasted 40 and 55 seconds, respectively. At 2304 on 15 August a M 2.9 earthquake occurred, which was the largest event in the series. As of 1400 on 16 August there were 41 events. On 18 August a climbing ban was placed on the volcano. Due to the abnormally high level of seismicity, scientists monitored closely for signs of an impending eruption. Scientists observed no large change in GPS data or images from the monitoring camera. On 28 September officials lifted the climbing ban but warned climbers that an eruption could still occur. Information Contacts: Volcano Research Center - Earthquake Research Institute (VRC-ERI), University of Tokyo, Yayoi 1-1-1, Bunkyo-ku, Tokyo, 113-0032 Japan (URL: http://www.eri.u-tokyo.ac.jp/VRC/index_E.html); Maki Kazuo, JMA-Sendai, 1-3-4 Ote-machi, Chiyoda-ku, Tokyo 100, Japan; The Japan Times. 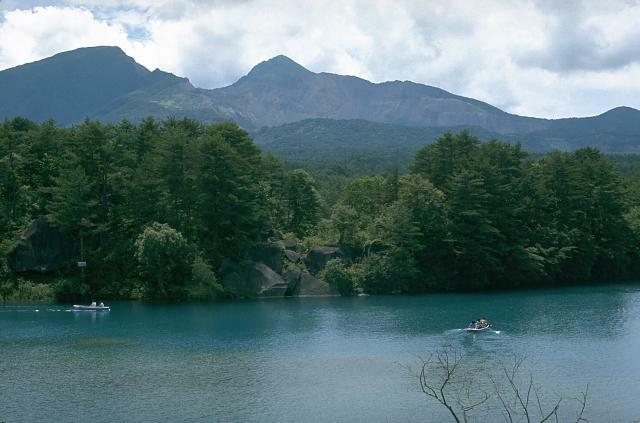 One of Japan's most noted volcanoes, Bandaisan rises above the north shore of Lake Inawashiro. This complex is formed of several overlapping andesitic stratovolcanoes, the largest of which is Obandai. 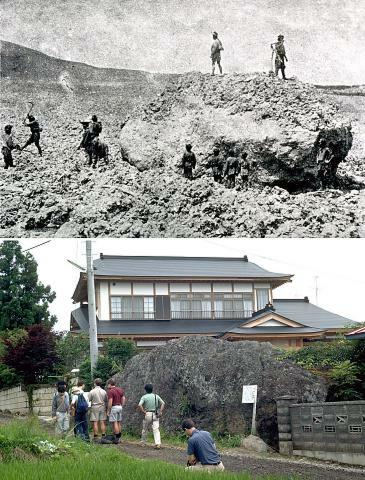 Kobandai volcano, which collapsed in 1888, was formed about 50,000 years ago. Obandai volcano was constructed within a horseshoe-shaped caldera that formed about 40,000 years when an older volcano collapsed, forming the Okinajima debris avalanche, which traveled to the SW and was accompanied by a plinian explosive eruption. The last magmatic eruption took place more than 25,000 years ago, but four major phreatic eruptions have occurred during the past 5000 years, two of them in historical time, in 806 and 1888. Seen from the south, Bandaisan presents a conical profile, but much of the north side of the volcano is missing as a result of the collapse of Ko-Bandai volcano during the 1888 eruption, in which a debris avalanche buried several villages and formed several large lakes. Mimura K, Endo H, 1997. Repeated collapse and reconstruction of Bandai volcano as revealed in the large outcrop of debris deposits on the southwest foot. Bull Volc Soc Japan (Kazan), 42: 3321-330 (in Japanese with English abs). Nakamura Y, 1978. Geology and petrology of Bandai and Nekoma volcanoes. Tokyo Univ Sci Rpt, 14: 67-119. Sekiya S, Kikuchi Y, 1889. The eruption of Bandai-san. J College Sci Imperial Univ Japan, 3: 91-172. Yamamoto T, Nakamura Y, Glicken H, 1999. Pyroclastic density currents from the 1888 phreatic eruption of Bandai volcano, NE Japan. J. Volcanol. Geotherm. Res., 90: 191-207. Yamamoto T, Suto S, 1996. Eruptive history of Bandai volcano, NE Japan, based on tephrastratigraphy. Bull Geol Surv Japan, 47: 335-359 (in Japanese with English abs). Yamawaki T, Tanaka S, Ueki S, Hamaguchi H, Nakamichi H, Nishimura T, Oikawa J, Tsutsui T, Nishi K, Shimizu H, Yamaguchi S, Miyamachi H, Yamasato H, Hayashi Y, 2004. Three-dimensional P-wave velocity structure of Bandai volcano in northeastern Japan inferred from active seismic survey. J. Volcanol. Geotherm. Res., 138: 267-282. There is no Deformation History data available for Bandaisan. There is no Emissions History data available for Bandaisan. Lake Hibara in the distance was created in 1888 when collapse of Ko-Bandai volcano produced a massive debris avalanche that traveled 11 km, nearly to the far end of the lake. The forested ground in front of the lake and the islands in the lake are part of the debris-avalanche deposit. The steep wall in the foreground is part of the back headwall of the avalanche scarp. 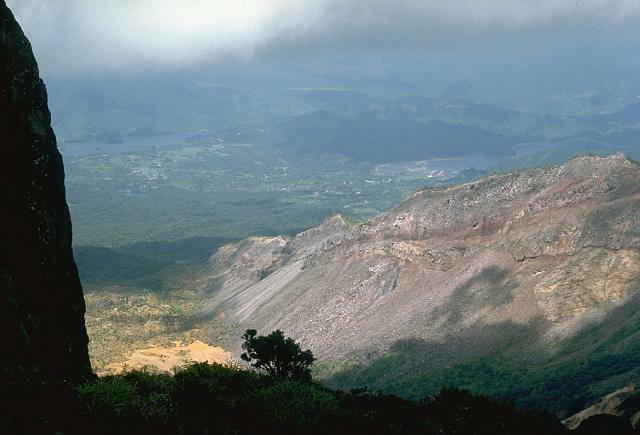 Collapse of the summit of Ko-Bandai peak during a strong phreatic eruption at Bandai volcano in 1888 created the 1.5 x 2 km horseshoe-shaped caldera that is seen here. The pond in the foreground was formed on the irregular surface of a 1.5 cu km debris-avalanche deposit. The avalanche buried several villages and blocked river drainages, forming several new lakes. Ashfall from the eruption reached the Pacific coast of Honshu. 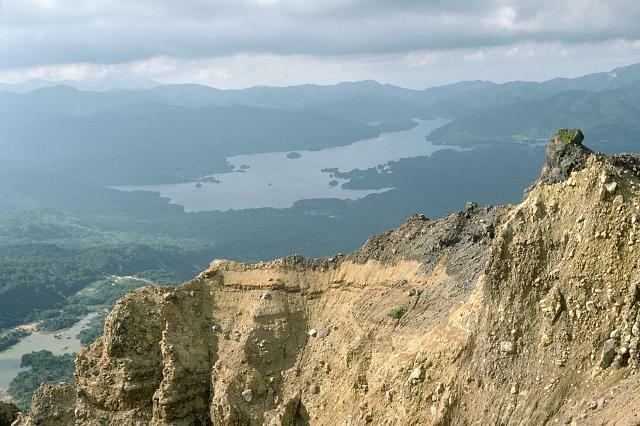 The steep escarpment at the right is the eastern rim of a horseshoe-shaped caldera created by the 1888 collapse of Ko-Bandai, one of a group of stratovolcanoes forming Bandai volcano. The two lakes in the distance, Onogawa (left) and Akimoto (right) were created when the resulting debris avalanche blocked river drainages. The caldera walls reveal the pre-failure structure of Ko-Bandai volcano, which consisted of a large pyroclastic core overlain by a thick veneer of lava flows. 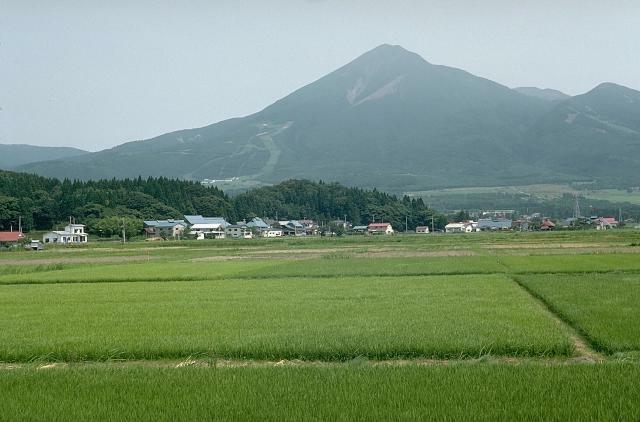 One of Japan's most noted volcanoes, Bandai-san rises above rice fields north of Lake Inawashiro. Seen from this direction, Bandai has a conical profile, but much of the north side of the volcano is missing, leaving a horseshoe-shaped caldera open to the north. This crater formed as a result of the 1888 collapse of Ko-Bandai volcano, north of the principal summit of O-Bandai, seen here. Akahani-yama (extreme right) is another Bandai stratovolcano. The forested ridge at the left foreground is part of an earlier Pleistocene debris-avalanche deposit. Large Eruptions of Bandaisan Information about large Quaternary eruptions (VEI >= 4) is cataloged in the Large Magnitude Explosive Volcanic Eruptions (LaMEVE) database of the Volcano Global Risk Identification and Analysis Project (VOGRIPA).